Phenomenally juicy, flavorful Thai Orange Peanut Chicken is is one of my favorite sweet, tangy savory chicken recipes ever! I’ve included instructions to both grill or bake your Thai Peanut Chicken so you can make it year round. Because you are going to want to devour this chicken year round because of the sauce. oh the sauce. The Thai Peanut Orange Sauce is so out of this world you will want to slather it on everything! Since reading that comment, I have been wanting to post a grill versison for sometime. So here you go! 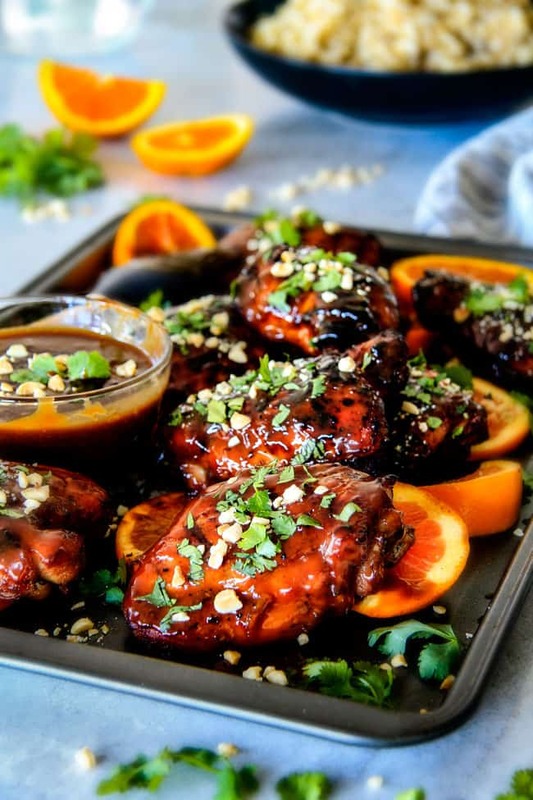 For this Thai Orange Peanut Chicken (Grilled or Baked) I used bone-in skinless chicken thighs because they are the absolute juciest chicken meat in my opinion. I love using them when I am grilling/baking chicken that stands on its own and is not going to be cut up and used in tacos/salads etc. 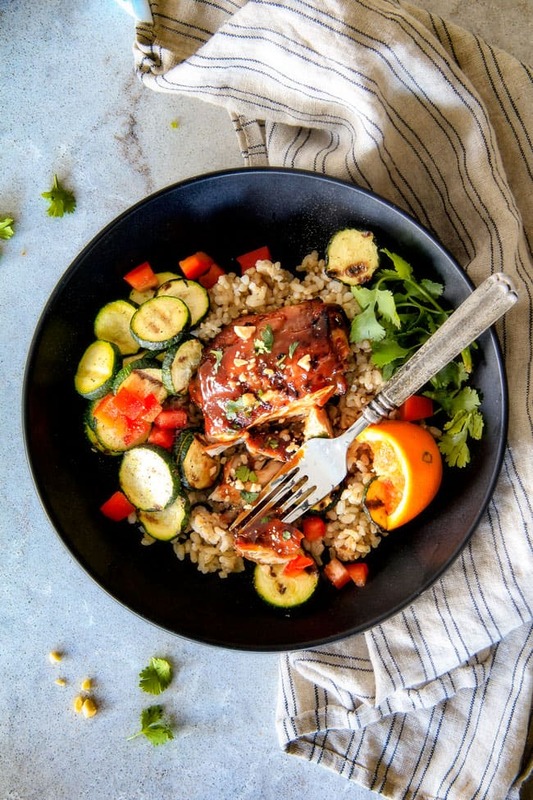 Feel free to use boneless skinless chicken thighs or even chicken breasts but just be aware that they will require less cooking time. 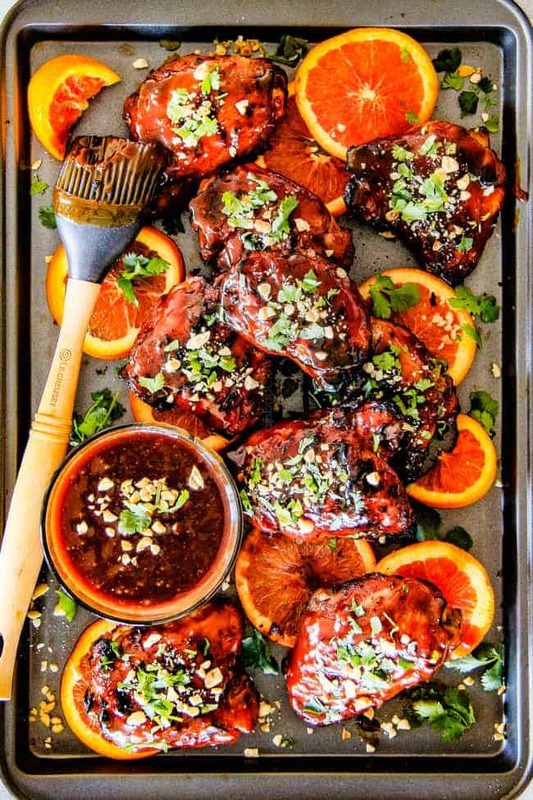 To start, we marinate our Thai Orange Peanut Chicken (Grilled or Baked) in soy sauce, orange juice, brown sugar and olive oil. You can skip this step all together if you don’t have the time as it just adds another layer of juiceness/flavor but the chicken will still be delicious without it (but more amazing with it 🙂 ). What I love about a marinade though is you can throw your chicken in the marinade/fridge and let the tenderizeing flavor bath do its work while you totally forget its there. When you’re ready to bake/grill your chicken, its always a good idea to let it sit for 30 minutes in order to cook more evenly. We take advantage of this time but rubbing our chicken all over with a wet spice rub of ginger, garlic, onion powder, paprka, cumin, salt and pepper. hellllo flavor! And now the real star of the show – the Thai Orange Peanut Sauce. 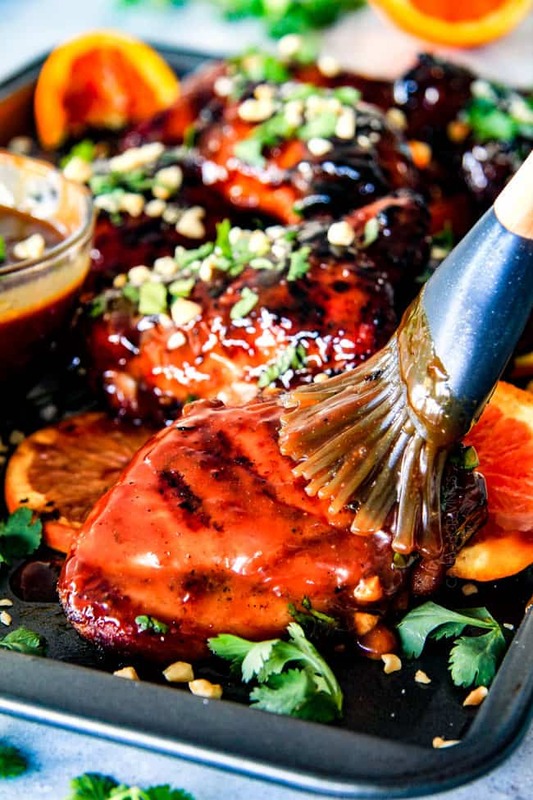 The ingredient list is a little lengthy, but it really does come togther very quickly with a quick whisking together of soy sauce, orange juice, orange marmalade, and splashes of ketchup, rice vinegar and fish sauce that we then simmer for 7-10 minutes. This thickens the sauce but more imporantly intensifies the flavors as it reduces. After slightly thickened, stir in your luscious peanut butter to add that irrestibe nutty flavor. And giddly devour with rice and veggies for one of your new favorite meals. ever. or at least I hope so! 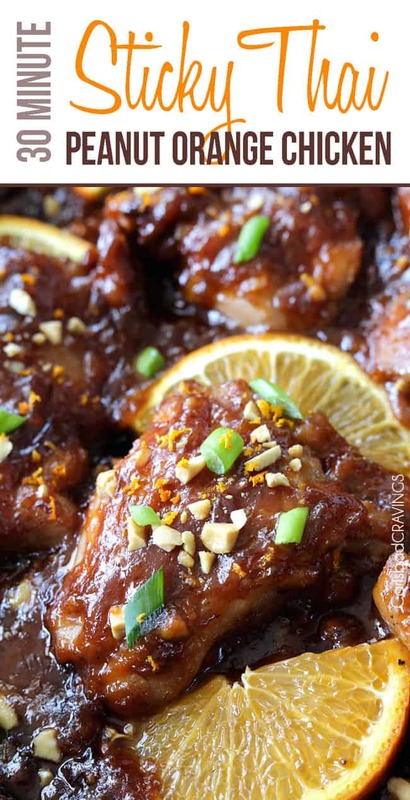 Want to try this Thai Orange Peanut Chicken (Grilled or Baked)? 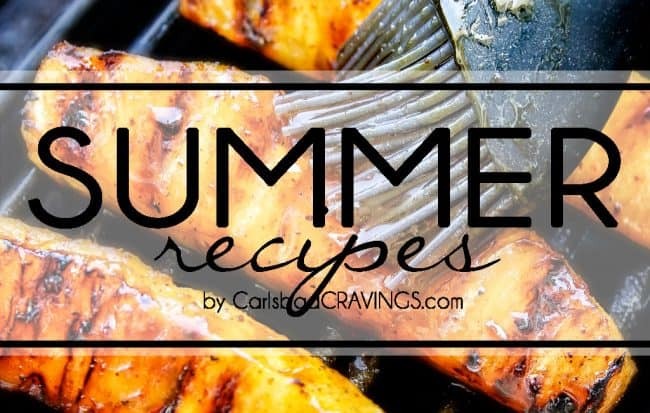 Pin it to your CHICKEN, DINNER, ASIAN or GRILL Board to SAVE for later! Phenomenally juicy, flavorful Thai Orange Peanut Chicken is is one of my favorite sweet, tangy savory chicken recipes ever! I've included instructions to both grill or bake your Thai Peanut Chicken so you can make it year round. Because you are going to want to devour this chicken year round because of the sauce. oh the sauce. The Thai Peanut Orange Sauce is so out of this world you will want to slather it on everything! 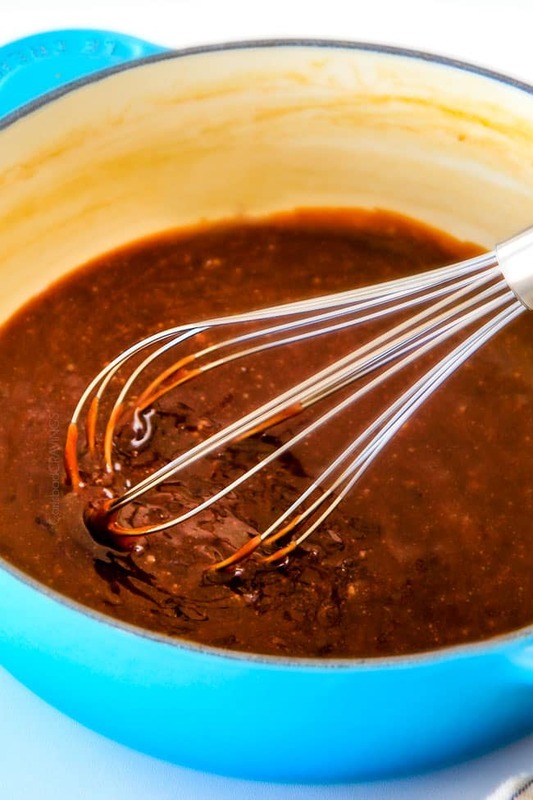 Add Marinade ingredients to a large freezer bag and whisk to combine. Add chicken, remove excess air, seal and turn to coat. Marinate 4 hours up to overnight. 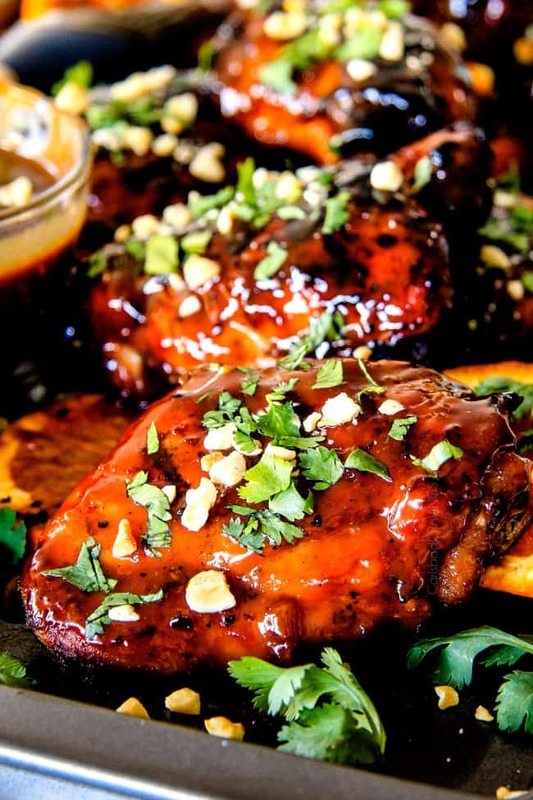 When ready to grill, remove chicken from marinade and dab off any excess. 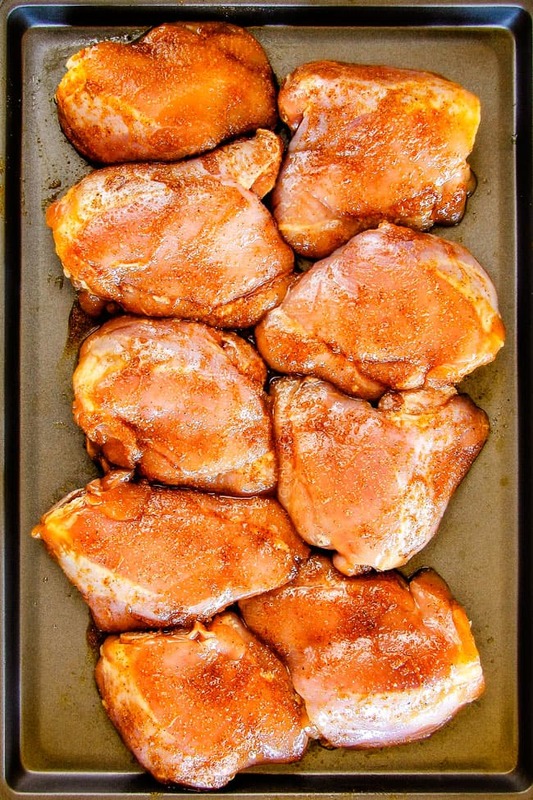 Place chicken on a baking sheet. Mix Wet Rub Spices with 2 tablespoons olive oil. Rub evenly over both sides of chicken. Let sit 20-30 minutes. Meanwhile, whisk all Thai Orange Peanut Sauce ingredients together EXCEPT Peanut Butter in a small saucepan. Bring to a boil then reduce to a simmer for approximately 7-10 minutes or until reduced and slightly thickened, stirring occasionally (it will thicken more as you add peanut butter and upon standing so make sure it’s not too thick). Stir in peanut butter until smooth. If sauce thickens too much before serving then return to heat and whisk in a little water to thin. Grease and heat grill to medium heat. Add chicken, cover, and cook 6-8 minutes per side, or until no longer pink and an inside thermometer registers 165 degrees F.
Slather chicken with Orange Peanut Sauce and garnish with cilantro and crushed peanuts. Serve with remaining sauce (extra sauce is especially delicious with rice). Preheat oven to 350 degrees F. Heat one tablespoon olive oil over medium high heat. Add chicken (you will need to work in batches), and sear 2-3 minutes per side. Add chicken to a foil lined, greased 9x13 pan (for easy cleanup), COVER with foil, and bake for 30 minutes. Remove foil cover, and continue to cook, uncovered an additional 15-20 minutes OR until an inside thermometer registers 165 degrees F at the thickest part of the chicken. I don’t know what to say…………I have chicken thawing this morning…….but need it for pasta salad….I am for sure going to make this, maybe tomorrow and get back to you. I have no doubt that this orange chicken tastes as good as it looks (or you wouldn’t have posted it 🙂 Thank you. Wow!!! Awesome Allie! I love your foodie enthusiasm, it makes life so fun! I hope you absolutely love this chicken as much as us, can’t wait to hear what you think! I’m so happy you made this chicken already Rachel and I’m so glad it was a hit! Thank you! I wanted you to know this was excellent! We made it on the grill using chicken and pork chops because I didn’t haven’t enough thighs. That dang sauce is so dang good! Wowser! This is recipe is restaurant quality for sure! I’m surprised there aren’t more comments here, maybe it’s because of all the ingredients. People!!! This is ACTUALLY A SIMPLE RECIPE which can be done in stages…a few minutes here and there. The main thing is to get the chicken marinating in the refrigerator. I’m so hoping you are having a good day. Thank you so much for the fabulous feedback Allie, and for the wonderul endorsement, I really appreciate it! I am so happy you loved this chicken so much and even found it “restaurant quality” – the ultimate compliment! I hope readers listen to urgings and make this chicken too 🙂 Thank you for all your awesome comments, I love hearing from you! This looks delicious, definitely on my “to-make list” this week! I am excited for you to make this Gretchen, I hope you love it as much as us! I am thrilled you loved so much Therese and found it simple too, thank you! And that is awesome you were able to make it in the pressure cooker – love that it cooked in 14 minutes, amazing! I still need to get a pressure cooker! Thank you for taking the time to comment, I always love hearing what you’ve been making!